Mozilla is available at Mozilla.org. 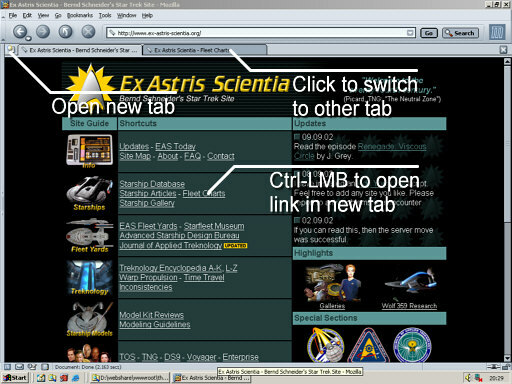 The browser relies on largely the same source code and has a very similar appearance as Netscape 7 which was also recently released. This is not a complete review of all features, but a collection of some impressions of Mozilla 1.1 (update notices about Mozilla 1.4 below). Many, yet not all findings apply to Netscape 7 likewise. Mozilla 1.1 and Netscape 7 are using the same core. But there is one difference between the two programs that the Mozilla startup is considerably faster - it takes about half as long on my computer. This may be because Netscape requires a long "registration" procedure that Mozilla seemingly doesn't have (and doesn't need). It is no surprise that the appearance of Mozilla is largely the same as already of Netscape 6. But I was never impressed with the latter, to put it mildly. 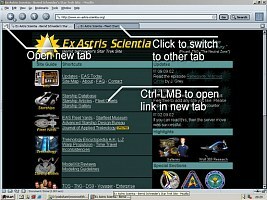 The fast and reliable Windows DLLs that had been used for the user interface until Netscape 4 were abandoned in favor of full Java control, only to incorporate a few more completely unnecessary effects like customizable skins and custom window styles. In my view, skins are about the last thing I would expect and I would want to have in an application software. After all, it's not the look of the user interface, but of the content that is important. In particular in a browser, a flashy skin may not go along with every carefully designed color scheme of a website. For me, it could have been the light gray "Classic" skin forever - although I admit I am using "Modern" because the Classic skin would sadly remind me of the lost speed. The side effects of skins and Java are well-known, especially if one was used to fast browsers like Netscape 3. Even on the latest systems, menus in Netscape 6 pop up with a palpable delay, and it's the same with text that is typed into the (much too short) location bar. Moreover, some very useful functions like right-clicking in entry fields were not available in Netscape 6, so copy&paste was only possible to insiders who were familiar with Ctrl-C and Ctrl-V, respectively. Fortunately, this bug has been fixed in the meantime. Mozilla 1.1 has a menu for copy&paste again. And the location bar is long enough again. But the browser has not become faster. Not all of the blocking functions work on all websites, but Mozilla 1.1 is at least as efficient as Webwasher, a separate tool for the sole purpose of filtering out things we don't want - Webwasher has several additional options though. The quality of the page rendering in Mozilla 1.1 is quite good and almost always looks like in Internet Explorer which has become much like a standard for web design techniques. Only vertical distances of paragraphs are sometimes different. Well, the standard form fields and buttons are still as ugly as in Netscape 6 (as if they couldn't decide between 2D and 3D), but that's about the only slight point of criticism. As already hinted at above, I need to admonish that the page display is as slow as in Netscape 6. Computers have evolved since Netscape 6 was introduced (and it was just not the right browser for a Pentium III or even Pentium II with 128MB at most), but Internet Explorer 5 and 6 are still palpably faster in displaying pages which becomes obvious especially when pages are loaded from the local hard drive. Without making precise measurements, my impression is that it takes twice as long with Mozilla 1.1 as well as with Netscape 7. The browsers are also slow when switching between several open windows. It seems that especially the otherwise useful tabs slow down the performance more than the same number of separate windows would. There is, however, one advantage I noticed in the new browser. Frame sets and pages with largely the same content do not flicker when they are reloaded in Mozilla, but with a seamless transition. Mozilla has a variety of mail functions which could be very useful - if the whole mail editor were not full of sometimes fatal errors. But to begin with a positive point, I have the impression that the mail management is a bit faster than in Netscape 6. Still, it has the "indirect" Java control feel, as opposed to Outlook Express which moves, opens and deletes files much like Windows Explorer. The search function of Mozilla is quite useful, as it is possible to search different fields in one search. But caution is advised especially when searching the message bodies, which may take up 100% of even a recent computer's resources. Go get a cup of coffee if there are hundreds or even thousands of mails to be searched. Another thing I simply hate is the HTML composer. I may be hopelessly old-fashioned, but I think that formatted text is a bad option for e-mails, even if all mail clients in the world were able to handle it. There is a very good reason for my opinion. Unformatted text, as it has been used for many years, is much easier and faster to write, as one does not have to bother about consistent font styles, colors and sizes, or about the peculiarities and bugs of the e-mail editor. This was especially important, as it was possible to reply to or compose new mails with vital content directed to business partners, for instance, without the danger of making embarrassing errors (well, except for typos). Now everything has to be perfect and takes away our precious time and nerves. HTML seems to have helped only the spammers to spread their messages with the most obtrusive colors and fonts available. Being used to plain and simple Netscape 3 for e-mail, I desperately searched for a possibility to switch HTML off in Mozilla or Netscape 7, and finally found that option. It is even possible to configure this individually for each account. Compared to Outlook Express it is pleasant that a carriage return inside quoted text in HTML will switch to normal text. The developers of Mozilla have obviously noticed that not all users like to comment about everything above or below the original mail. Speaking of quoted text, there is a bug that may make composing e-mails very hard. After copying & pasting text into an e-mail reply, I made a line break after the following quoted paragraph, and the inserted text suddenly moved to my current cursor location in this paragraph. I couldn't reproduce the effect, but in that one e-mail it occurred systematically. But there are still more bugs. Sometimes when I want to reply on a message, a window appears where nothing is quoted of the original message and nothing can be edited. It is necessary to restart the browser in such a case. One possibly minor point I noticed is that it is still not possible to attach more than one file at once in Mozilla 1.1. Outlook users are experiencing more comfort in this respect. There is one evil bug I once encountered in Mozilla, and I am sure that it won't be the last time. A message contained a large attached image, and after clicking on it and displaying the image, the mail window was dead. I could still click around and select menu items, but nothing was done. Much worse, closing and re-opening the window or the browser didn't help. I then accessed the mail files with Netscape 3 and saved them, only to notice that I couldn't delete the index file of the Inbox mail folder. Finally, I saw that there was still a Mozilla 1.1 process in the memory, and after terminating it, I was finally allowed to delete the mail file. It is not new that Netscape has problems with displaying large images. Netscape 3 routinely caused a total system crash when it was low on resources, but I would expect precautions against something like that in a more advanced browser, considering that e-mail is a crucial application of any computer. Like in Outlook Express too, file attachments in Mozilla are displayed in the e-mail listing and also in the head of the message and thus easily recognizable. Unlike it is the case with Outlook Express (which is very annoying in this respect), it is possible to save e-mails under a different name and to create sub-directories for them. But there is also one thing that needs to be considered a severe drawback of Mozilla, that received e-mails are not marked as answered after one has replied. This should have been possible in a modern e-mail application. Instead of that, there is a rather useless function to assign colors to e-mails representing "important", "personal", "to do" etc. They could as well have included terms like "extremely urgent", it is all meaningless, especially if mail is arranged in directories anyway. Of course, the longer a program is being used, the more bugs (and sometimes useful features too) become apparent. 1. The memory and disk cache may be nasty. With the option "compare the page in the cache to the page in the network" set to "once per session" which seemed a reasonable interval to me, my cache very often insisted on displaying the old version of the pages of my own website although I had modified them in the meantime. Reloading doesn't help, although this, as I pointed out above, takes quite a while even for local pages. The only way to get rid of the old version is to clear the cache, an option that is hidden under Edit --> Preferences --> Advanced --> Cache. 2. Mozilla's image manager (Tools --> Image Manager) allows to determine from which sites images are not to be loaded. This may become handy to block banner rotation services once and for all or to focus on the content of text-based sites with irrelevant ads or other graphic elements. But on the downside, it is possible to take actions without noticing it. It once prevented loading images from my own server, apparently because I was just in the course of uploading something and one image was not available for about a second. But actually, while desperately trying to reload (see above), I may have accidentally clicked "Block images from this server" and not noticed that. It is always good to check the image manager if something on a page is not loading. This will make Mozilla search for the icon that IE finds (or is supposed to find) automatically. The favicon may be of any other web image file format too, while IE allows only Windows icons. 4. Who in the world had the idiotic idea that, in HTML, a mail attachment is re-attached to the reply? Would anyone ever want to send back the unchanged original image or document to the originator, and would the originator like to receive it? What an incredible stupidity and waste of bandwidth! Of course, I can disable that option, but as a default option with HTML mail, most people are likely to use it. 5. The godawful program corrupted my Inbox while I was downloading messages. I tried everything to access them, but the 11 messages are irretrievably lost. The whole disaster seems to be connected with an old flaw of Netscape, that it either expands the mail folders to the extreme (the corrupted Inbox was 52MB), or asks to compress the folders every time mail is accessed (where "compressing" actually means that old data is deleted). The same happened several more times. 6. Mozilla is not able to recognize MIME types correctly. The program comes with no helper applications defined, and apparently seems to "forget" the correct associations from time to time. Some JPG files are not recognized as such. The other way round, the image editor is opened for ZIP and even TXT files. It is all a complete mess, and I have ended up saving all attached files instead of trying to view them. 7. Downloads are no pleasure with Mozilla. By default, the annoying Download Manager window keeps popping up for each and everything that is being saved, even for images or for HTML files and even if it's just being viewed and therefore already in the memory or disk cache. If the Download Manager is disabled, there is no status message about downloads at all. At least, the Download Manager may be accessed manually in such a case. 8. Another bug: I typed a new URL in the address bar, but instead of jumping to this new URL, the page currently displayed was reloaded. This didn't occur a second time, though. 9. I frequently notice rendering errors in Mozilla. They may have to do with the graphics board, but I never saw something like this in Internet Explorer. Parts of images are missing or are scrambled. It almost looks like a sync problem as if it were analog. Reloading the page is no help. The display problem may only be removed by emptying the cache. 10. Not exactly a bug, but a problem: As nice as it is to follow links by simply clicking Ctrl+LMB and letting them load in the background, loading several pages at once may overstress either the connection or the server. If the connection fails, the URL will be lost - unlike it is in Internet Explorer, where the URL is displayed in the URL bar from the very beginning. In Internet Explorer it is possible to open a link for loading, immediately hit "Stop" and resume later. In Mozilla the page will change to a blank page if the loading process is halted prematurely. Something similar happens if a loading page is too early interrupted manually. Mozilla 1.1 is a state-of-the-art browser, more than on par with Microsoft Internet Explorer 6 in most respects. Especially the tabs and the ad filter functions make browsing a pleasure again, after a long time in which most mouse clicks had to be wasted either to resize or to click away windows. For the frequent user, Mozilla 1.1 is a powerful tool, even though its page rendering speed is inferior to Internet Explorer. The program has an overall pleasant mail management, but several evil bugs may make even the most basic operations a pain. In this respect, the competitor Outlook Express, as unsafe it may be concerning worms, is much more reliable. 1. Searching E-Mails is a lot faster than with version 1.1, and it is possible to go on working with Mozilla while it's done. Someone obviously tamed a resource killer in the software. The whole e-mail management seems to work faster and more reliable. 2. A severe bug concerning the second SMTP server was fixed. With version 1.1 it was allegedly possible to use a second SMTP server, but the configuration window refused the "OK" button so that it was actually impossible to add a second server. 3. There is a new spam recognition, but I'm not fond of it at all. It is of no use if mails are recognized as spam as late as they are already downloaded and in my Inbox. I can much better intuitively decide myself what is spam than teach the filter. 4. The problem with the windows that don't show the URL until they are completely loaded (see 10. above) does not occur any longer. It is now possible to interrupt the loading process and resume later without losing the URL. 5. But ironically, there is a new problem with interrupted downloads. In version 1.4 it is impossible to display incomplete JPGs. An error message occurs as soon as the "X" is pressed to interrupt the download, even if the image was almost completely on display. 6. Mozilla 1.4 comes with the Personal Security Manager (PSM) that was missing in version 1.1. It is necessary to use certain secure logins, like online banking. 7. Website authors still don't like Mozilla or they give a damn about it. Several sites don't load or refuse to show certain features with the nice suggestion to get a newer browser (although Mozilla 1.4 is currently the most recent browser to exist). Also, Flash 6, although installed, is sometimes not recognized with Mozilla 1.4. It always works with IE. 8. Mozilla 1.4 once deleted my bookmark file and replaced it with an empty file. I had no backup, except for a very old file from last year and a parallel collection on my laptop. Never forget to backup your bookmarks regularly! Although Mozilla makes it extremely hard to find the file (like the mail files too), because they are hidden in some sub-sub-sub-sub-sub-directories with incredibly cryptical names. I recommend to use links to these directories to make manual copies or include the paths to a backup routine.